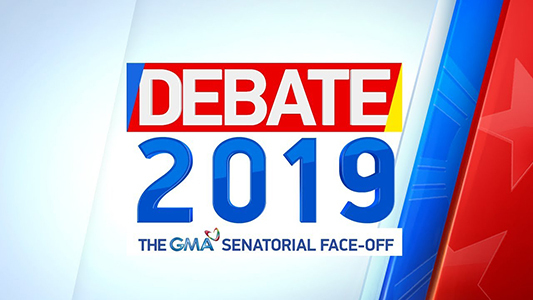 SHOW DESCRIPTION: True to its commitment to delivering the most credible coverage of the upcoming May polls, GMA News and Public Affairs mounts Debate 2019: The GMA Senatorial Face-Off this Saturday, February 9. This senatorial debate will be moderated by GMA News pillar Vicky Morales and senior news anchor Pia Arcangel. Esteemed GMA News pillars Jessica Soho, Arnold Clavio, Howie Severino, and Mel Tiangco join the debate as panel members. This entry was tagged Debate 2019: The GMA Senatorial Face-Off. Bookmark the permalink.